To further Laurie’s spotlight of the Officials Clinic on May 6th, I thought I would provide some context. I began officiating last Fall as a way to contribute to the my kids’ activities and the sport, get off of those narrow bleachers, and to enjoy watching all of the events up close. I officiated at over 40 sessions last year, including the Junior Olympics in Bowling Green, and it was tiring (running up and down the side of the pool without falling in can be a trick), trying (sometimes coaches and parents can be, um, passionate), but also mentally challenging (in a good way), fashionable (who doesn’t like white over blue?) and very rewarding. I have found my new hobby and I encourage you to consider joining the Buckeye Officiating Team of Bill Hammond and me. You’re going to the meets anyway, right? If you have any questions, please feel free to give me a call at 288-7003. The Officials Clinic is on May 6th from 1-4 PM at the Northwest Library, 2280 Hard Road, Columbus 43235. I have been receiving a lot of questions about move ups, when they happen for each swimmer and how we decide to move swimmers on to the next groups. I thought I would take a moment to address how our groups are structured and when swimmers are moved into the next group. Most move ups are generally made in the FALL, we like to use the spring & summer to hold as many combined group practices as we can to help transition swimmers from one group to the next. The biggest and most difficult transitions for a swimmer occur when they move into a new training group that has a new name (e.g. moving from 1 to 2 is fairly simple for a swimmer, but moving from Silver to Scarlet or Scarlet to Senior is a big jump). Our groups are set up so that a swimmer stays in a group for about two years, these two years typically coincide with swimming competitive age groups. (Note: the ages you are about to read are GUIDELINE ages for each group, older and youngerswimmers are sometimes placed into different groups). Silver comprises our 10 & under competitive program (1 is 8-un, 2 is generally age 9 to 10). Scarlet makes up our 11-14 year old/middle school program (1 is age 11-12, 2 is age 13-14). Senior makes up our High School program with swimmers age 14 and over. Our Buckeye Select program is for our pre-competitive youngsters and older swimmers that are not interested in training for competitive swimming. This spring and summer we have arranged our practices to challenge our swimmers to train at the next level, whether that means swimming faster in their own group or trying to keep up with a group in the next lane. Many of our practices will be combined with multiple groups with swimmers placed in appropriate lanes to challenge them to the fullest.We are very excited about this opportunity for our swimmers to step up their training over the next 15 weeks and hope that everyone can get to as many practices as possible top take advantage of these opportunities. Side note: we DID have a lot of move ups last spring. This was due to our final transition from our old grouping system to the system of groups we currently use. It is very unusual to see move ups in the spring, they typically occur in the fall. Please feel free to send any questions you have about your swimmers group placement to me at any time. It's time once again to sign up for meets. We have a very exciting slate of meets for our team this summer and would like to see our kids push themselves in the long course format. Please take a moment to look the schedule over and get registered. This clinic is for individuals considering becoming an official as well as those who need to renew their certification and cost $6.00. Looking for a way to get more involved in your child's sport? Maybe you are looking to find a way out of the stands or get a better spot at the pool. Let’s celebrate a great season of swimming! · Awards- Each swimmer receives a participation award. To make your reservation send check along with the bottom portion of this flyer to Heather Weidenhamer (address below) or place your check and slip in an envelope Attn: Heather Weidnehamer in the banquet folder found in the “WEIDENHAMER” mail folder at Columbus North. Please return your payment by April 20th. *If you are a member of the Lakes, the amount paid will go toward your monthly dining commitment. Please indicate your membership number in the space provided. ** In addition, if you’d like to make a donation to a gift for the coaches, please include it in your check with a notation of how much you are giving on the form. We will be purchasing gifts for the coaches to be presented at the banquet. Wednesdays – with Senior – will alternate weeks 4-6 pm and 7-9 pm. SPLIT PRACTICES BY GENDER (will alternate weeks). 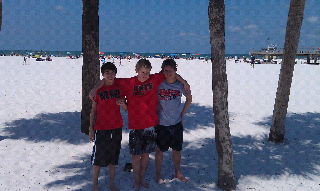 Here's a picture our boys Jeremy B, Jeremy K and Nick R enjoying some beach time between sessions at the NASA Showcase Classic in Clearwater, Florida. Congrats boys on a great meet with tough competition. All 3 boys gained invaluable experience and we're able to achieve personal bests throughout the meet! The world's #1 training center for young athletes and youth fitness. No matter your sport, no matter your age, Athletic Revolution has a proven system for training that will be successful at helping you reach and dominate at the next level. As far as I know we are the only group that puts 100% of your Kroger Community Rewards into your account. Most PTO's keep a percent for their organization. April is re-enroll month - we usually do very well in the summer months as many schools do not push re-enrollment until the fall. This gives us a bigger piece of the pie for Kroger to send our way. Kroger rewards are simple to use - you just scan your linked Kroger card at checkout. We receive quarterly statements of your rewards that we put straight into your meet or travel fund. Register online at www.krogercommunityrewards.com and select Buckeye Swim Club when you enroll. Enter the Buckeye NPO number (80337) or name of organization, select organization from list and click on confirm. Open practice this week is Wednesday 4:30-6 and Friday 6-7:30. All swimmers are welcome.